Do you remember the last time you were sick? Whether you had vomiting and diarrhea or the flu, you probably had no appetite. When you’re sick, drinking and eating can seem undesirable. However, it’s important to eat healthy foods and stay hydrated in order not to get sick again. Staying hydrated is one of the most important things you can do after you’ve been ill. Water makes up between 55 to 75 percent of our body weight, depending on age. This is why people can survive for only a few days without liquid. According to the National Academies of Sciences, Engineering and Medicine, men should drink 3.7 liters (125 ounces) of water per day and women should drink 2.7 liters (91 ounces). If you're not drinking this much water every day, you should consider consuming more fluids. If you don't like drinking plain water, try coconut water or water with lemon. Certain foods can help you hydrate, too. Hydrating foods to eat when sick include fruits and vegetables high in water content, like cucumbers, spinach and watermelons. These foods can also easily be integrated into smoothies or soups. Be sure to drink lots of fluids and consume hydrating foods when you’re ill as well as afterward, since being ill makes you lose a lot of water. Along with staying hydrated, eating nutritious food is important not just when you’re sick, but also afterward to help your body recover. Once you start to feel better, take care to choose the right foods. If you’ve had the flu or a bad cold, chances are you’ve been feverish, which can cause you to feel unable to get warm. Consequently, the best foods to eat when you have a cold are warm ones, like soup. 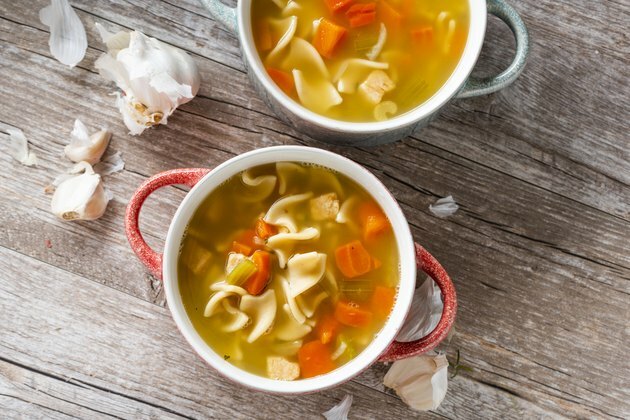 Not only can soups warm you up, but they act as natural decongestants. Good soups contain nutrient-rich vegetables and protein from a bone or meat broth and can even include healthy whole grains. Healthy, nutritious foods like these will easily help you combat fatigue after being sick. They’ll also keep you hydrated since you need to increase your fluid intake when you’ve had a temperature. Experiencing vomiting and diarrhea with a queasy, sensitive stomach can be a sign of food poisoning. With these symptoms, you should avoid heavy foods like fried foods, foods from refined sources and foods with high sugar content that can exacerbate your symptoms. You may also want to avoid caffeine, citrus foods, spicy foods and fatty foods that can worsen your nausea. Instead, try to eat nutrient-dense foods that help your body return to normal. Vomiting and diarrhea both cause loss of fluid, leaving you dehydrated, so lean toward hydrating foods. If possible, try to have fruits and vegetables rich in fiber. Soluble fiber can help reduce diarrhea. Also, include foods that are easy to digest such as saltine crackers, white rice, or white bread or toast. If you’re pregnant and feel ill, eating nutritious foods is even more important. These include fruits, vegetables and healthy, lean proteins — all rich in vitamins and minerals that help strengthen your immune system and help keep you from becoming sick again. Although nausea and vomiting are common during pregnancy, these can influence your nutrient consumption and dietary intake. A sensitive stomach can make it difficult to eat, but certain foods can help. Ginger can help reduce nausea, even in pregnant women. What Are the Causes of Chills & Feeling Very Cold?